Deer hunting is a fun hobby, but it's important to prepare for the journey carefully before setting out, especially if it is your first time. Make sure to follow these basic safety rules to ensure that you have a good time without putting yourself or others at undue risk. The first thing to do is make sure that you have all of the required licenses and permits. Every jurisdiction does it slightly differently. In most places, however, the local authority governs which weapons can be used and which animals can be hunted in each season. For example, at one point of the year it might be legal to hunt deer with rifles, and during another it might be legal to use bows and arrows. Of course, before even getting the hunting permits, make sure that you have any necessary licenses and permits for the weapons you will be using. These laws are in place for safety and to protect the natural herds of animals from overhunting, so make sure to obey them. Once you are sure that you are familiar with local hunting laws and you are in compliance with them for licenses and permits, the next thing to take care of is clothing. 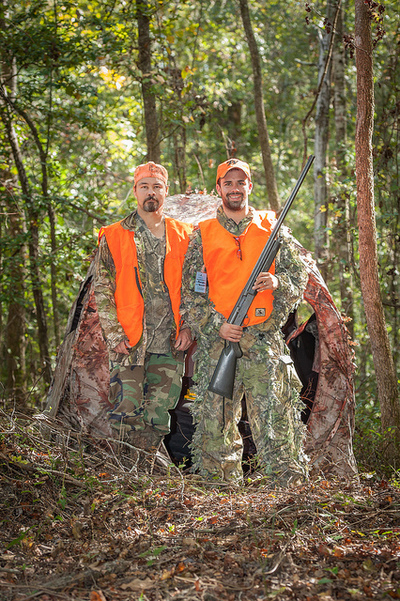 Clothing is important for hunting safety, because it allows you to be seen by other hunters. The best color to choose for visibility to other hunters is orange. 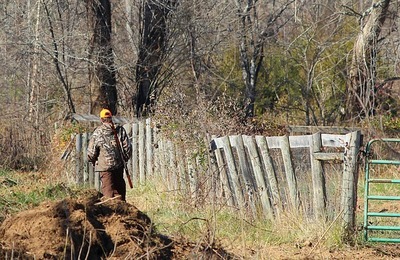 Some local authorities legally require hunters to wear a certain amount of orange clothing. Wearing orange will not compromise the hunt, because deer do not have good vision, and wearing orange will not make hunters stand out to a deer. Aside from the orange, camouflage patterns are a good idea. These can vary with the season and location. Finally, a good pair of boots is a critical part of a hunting outfit. The great outdoors can be wet and muddy. Look for boots with thick soles and good insulation. Aside from having good grip, the boots should be warm. The best time for hunting is usually not the most comfortable weather, and cold feet can cut a day short or make it uncomfortable. Next, collect the right gear. You should have, at minimum, a pair of binoculars and a fanny pack or small bag with some useful equipment. This might include bug spray, a flashlight, a knife, a compass, and a first aid kit. Another good idea is a field camera. These are great for helping you capture the best trail shots on your trip and if you're lucky, your wildlife photo might end up a winner in an online contest. Not all cameras are adequate for taking pictures on a hunting trip though, so make sure to research field cameras and find one that has good durability, battery life, and picture quality. Finally, prepare the area. Scout out the place where you will go hunting, and if possible, set up some tree stands where you can perch comfortably. Keep in mind that hunting is mostly a waiting game. Making sure you know the area, where deer tend to roam, and where to wait will make the day itself run more smoothly. 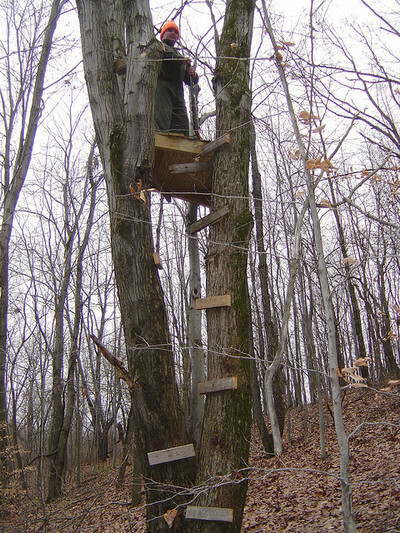 Tree stands and blinds do not need to be elaborate- just workable. Dropping a little bit of bait in the hunting area can also help attract deer. Fruit, corn, sugar beets, or salt licks can all draw in deer, lessening waiting time. If you take these steps ahead of time, you will have a safer and more enjoyable day on the hunt. A little bit of preparation will go a long way with hunting, and anytime there are weapons involved, following the correct safety precautions is essential.